In the past I would obtain finalized travel itineraries from my travel agent, print them out, and put them in a folder of my briefcase. However, since I travel so much, there are many times I do not have direct access to a printer and furthermore managing the paper documents for each week’s travel was getting cumbersome. I needed a better way to streamline this whole process, have quick and easy access from my mobile devices, be able to let family members know my itinerary easily, integrate into my work calendar, be notified of any changes in my flights, and do this all with limited amount of effort. I have now implemented a way that provides me ease as well as possibly better management of all my travel details. Find out more after the connection. I am going to set forth all the items that you need to replicate my workflow and then in the end summarize the whole pipeline. The first thing you need to do is sign up for a free TripIt account. You can find them here http://www.TripIt.com. TripIt is a great service that organizes your flights, hotels, meetings, and other types of travel events all in one place. The power of TripIt is really two fold. First, once you set up an account, you can email plans@tripit.com almost any detailed itinerary you receive from booking a travel event and it will automatically scan it and incorporate the details into your TripIt account. Second, TripIt allows many other mobile applications to sync with the data it stores. So, once the information is in TripIt, the data can be replicated to other devices for viewing. The next piece of the puzzle is to be able to view this data in a paperless fashion and have it on my mobile devices. I should mention at this point that TripIt does offer an app for most mobile platforms (e.g. iPhone, Android, etc) and while it is functional, you must pay a certain amount per month for TripIt pro to achieve flight change push notifications or to notify others (e.g. mothers and fathers). For those that aren’t in the know, push notifications are when the service “pushes” a notification automatically to your phone to notify you of a change. Good thing there are plenty of apps out there that sync with TripIt and that provide change push notifications for free. I have recently settled on an app called FlightTrack Pro. You can find it on iTunes for a cost of $10. My thought on paying for the app was that a single cost was better than paying every month for TripIt Pro that provides push notifications for flight changes. It also met my iPhone user platform requirement but, I am sure there are other similar mobile applications for other platforms. FlightTrack Pro provides syncing with TripIt, provides notifications on gate changes, delays, cancelations, as well as other push notifications and information. Furthermore, once the data is synced, it can also puts the flights and their times within your calendar. BONUS! Now all my work colleagues can see when I am up in the air and where I am going. Let’s do a quick summary of where we are at. I use the TripIt service to hold all my travel information and FlightTrack Pro to sync with TripIt and then provide me push notifications on any changes to my schedules. I do however use the TripIt iPhone app to view non-flight (e.g. hotel, etc) confirmations though. Yet, I was still lacking the ability to automatically share and/or update family members of my trips (this functionality is also provided in TripIt Pro) and emailing all of the final itineraries from my travel agent was slightly cumbersome (ok, so I was getting lazy about selecting the email itineraries and clicking “forward” to plans@tripit.com; don’t judge me!). To minimize the repetitive task of forwarding my itineraries to plans@tripit.com, I set up an automatic email filter in Microsoft Outlook (my company uses an Microsoft Exchange server) to scan ever email for who sent me the email and if it contains a confirmation code in it. If the answer was yes to both of those, the Exchange server would automatically forward the email (presumably an itinerary) to plans@tripit.com. Easy, seamless, and all hands off! Use your newly saved time to sit back and drink a beer instead. The final piece that I was missing was to automatically share or alert loved ones of my itinerary or changes (e.g. cancelations, eek!). As mentioned previously, I believe TripIt Pro provides this functionality, however, I also do not want to pay ~USD$10/month for it. I am cheap, cheap, cheap. Enter in a service called TripCase . They even have an iPhone app. Within the settings of your TripCase account on the website, you can set it to automatically share and notify set individuals. I have set it to automatically share and notify my mother and mother in-law. How does TripCase know your travel information? Well, just like TripIt, you can forward the email itinerary directly to trips@TripCase.com. So, my automatic Outlook filter is set to forward to TripIt and TripCase. That was a whole lot of writing for a workflow or pipeline that is pretty simple. To summarize, let me break it down for you. I receive a final itinerary from my travel agent. The itinerary is automatically forwarded to TripIt and TripCase, parsed for information by each service, and entered into each of my TripIt and TripCase accounts. I open up my FlightTrack Pro app on my iPhone and it automatically syncs with TripIt showing me all my flight details and automatically adding them to my iPhone calendar, which happens to be my corporate Microsoft Exchange calendar. For details regarding hotels, I just open up the TripIt app. So, all the details are at my finger tips and without using or carrying any paper. Now just don’t lose your phone or run out of batteries. 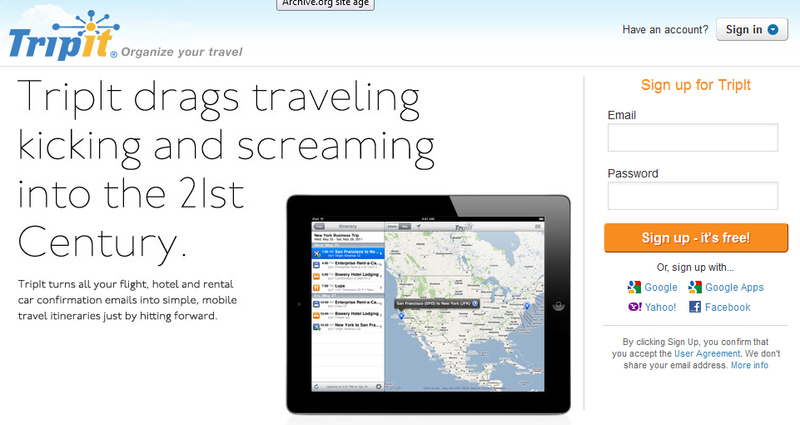 However, in a worse case scenero, you can always go to www.TripIt.com, log in, and print out your itinerary :).